Parallels between species have propelled collaboration and coordination in oncology research that is proving beneficial to both people and pets. 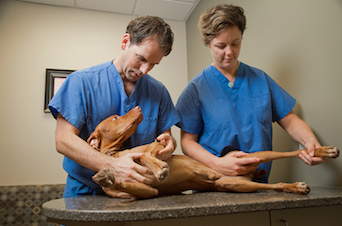 Duke surgical oncologist William Eward, DVM, MD, and his wife, Cindy Eward, DVM, DACVS, who practice at Triangle Veterinary Referral Hospital in Holly Springs, North Carolina, perform an orthopedic exam on their dog Virgil. William Eward is also an orthopedic oncologist at Duke. The National Cancer Institute (NCI) defines comparative oncology as “the study of naturally developing cancers in animals as models for human disease.” For years, mice have been the major preclinical model for oncologic studies, for several reasons: They can produce 1 litter of 10 to 15 offspring per month, providing a steady supply of research subjects. Since 1 mouse year equals about 30 human years, studies can be conducted at an accelerated rate compared with human trials. And the mouse’s genetic makeup resembles humans’ in many ways. A recent study, however, has shown that implanting human cancer tissue in mice changes the tumor’s genome in ways that are not usually seen in the human body,1 making the possible benefits of investigative drugs difficult to determine. Mice raised in labora-tory environments are often stressed, potentially affecting experimental outcomes, and rodent xenograft studies tend to be slow and expensive. 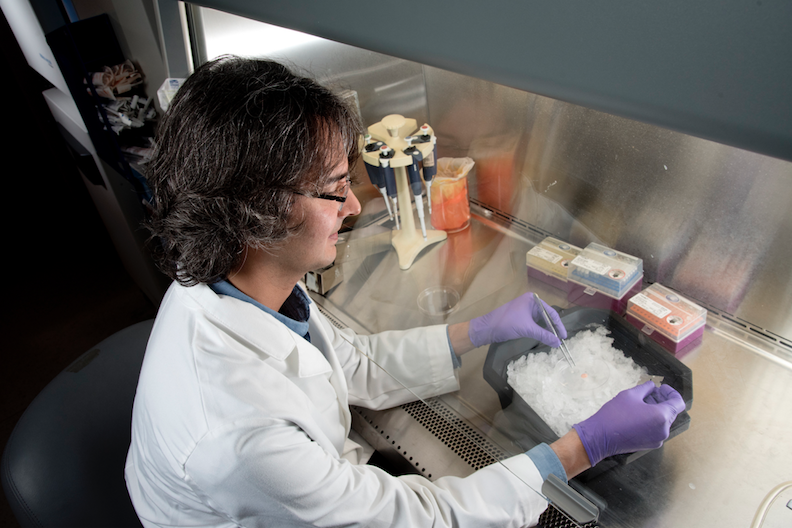 Duke’s Erdem Altunel, MD, processes a human patient–derived xenograft. He will then grow cells from the sarcoma tumor in a dish to develop cell lines for drug screening. It turns out that an alternative has been literally lying at our feet. Because they get many of the same types of cancers humans do, dogs have long benefited from human oncology drugs, including chemotherapeutic agents. Now many of those benefits are beginning to flow back into human medicine as researchers increasingly employ canine patients in clinical cancer trials. 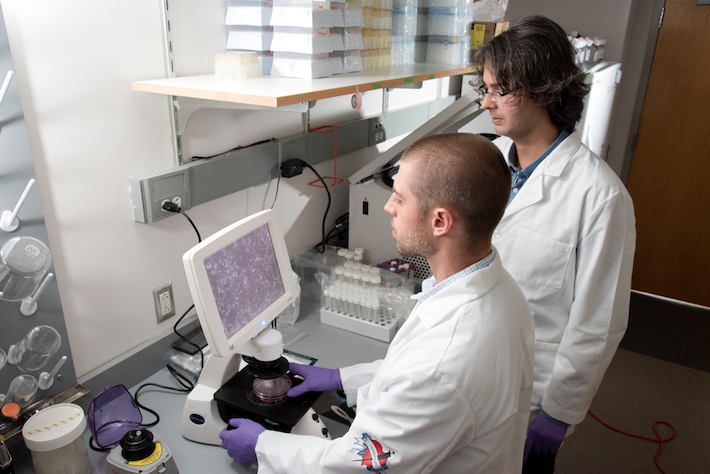 Duke’s Jason Somarelli, PhD (left), and Erdem Altunel, MD (right), examine canine sarcoma cells under the microscope. Matthew Breen, PhD, CBiol, FRSB, is uniquely positioned to understand the synergistic opportunities presented by the dog model: His laboratory aided in sequencing the canine genome in 2004. “It was a phenomenal thing for me to be involved in, because I started my career working on the human genome project in the early 1990s,” he said. Dr. Breen, the Oscar J. Fletcher distinguished professor of comparative oncology genetics in the Department of Molecular Biomedical Sciences at North Carolina State University (NCSU) College of Veterinary Medicine in Raleigh, was struck by the remarkable similarities. One reason dogs make effective models is that they live with us, said Douglas Thamm, VMD, Barbara Cox Anthony professor of oncology and director of clinical research at the Flint Animal Cancer Center at Colorado State University in Fort Collins. “They drink the same water we do, sometimes eat the same food, and walk around on the same grass that’s been exposed to the same chemicals,” he said. Dr. Thamm also noted that, unlike in mice, canine tumors arise spontaneously, as human carcinomas do, with the same kind of heterogeneity. Cancer in dogs can develop resistance to therapy, as in human cancer treatment, and can metastasize in similar ways. And dogs have a fully intact immune system, making it easier and more effective to study new immunotherapeutic agents. The statistics of canine cancer are sobering. “Dogs generally get about 10 times as much cancer as people do,” Dr. Breen said. “In this country, it’s estimated that there are about 80 to 85 million pet dogs and about 6 million new diagnoses of cancer every year, so it’s a huge problem.” If there’s a silver lining, he said, it’s the opportunity for investigators to study cancers that are relatively common in dogs but rare in humans, such as osteosarcoma. Fewer than a thousand cases of bone cancer are diagnosed in children each year, according to Dr. Breen. “On the one hand,” he said, “we’re glad a large number of children aren’t affected by it, but because there are so few, it’s more difficult to study.” However, in the canine population, there are more than 50,000 cases a year, he said, providing a large pool of subjects to analyze and the hope that new drugs and treatments can be created to benefit both the canine and human populations.